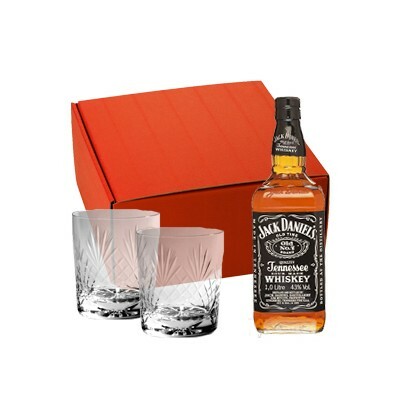 Small Jack as we call it is a gift set featuring a half bottle of Jack Daniels whiskey with two decent cut crystal tumblers. The original Tennessee Whiskey our Small Jack Daniels Gift boxed set is a best seller. Jack Daniels Whiskey - Made in Tennessee USA the Whisky is mellowed through 10 feet of sugar maple charcoal and then matured in Oak Barrels. Only when the tasters are happy that the whiskey is ready will it be bottled and ready for consumption. The ideal gift for someone who likes Jack Daniels Whiskey. The Tumblers are large enough to take a mixer and there are other Tumbler style and cut options available.